What the heck is a fjord? Beautiful Skagway, Alaska on the left. The Lynn Canal on the right. That’s a fjord! When you’re cruise ship is heading for Skagway, you will eventually enter the Lynn Canal. At some point, your captain or purser is going to come over the loudspeaker and tell you that the ship in a fjord. Huh? What the heck is a fjord? Good question. The Lynn Canal is the deepest fjord in North America. Woot! That’s right. On your approach to Skagway, you are actually passing through the deepest fjord in North America. How deep is it? Over 2,000 feet deep. That’s pretty deep alright! It’s also one of the longest and deepest in the entire world, which is pretty darn impressive. It’s even more impressive if you actually know what a fjord is, so let’s go down that road. Things don’t just pop up out of nowhere for no reason. When you buy a Ford truck, you know it was made by General Motors. Well, fjords are created by glaciers, it just takes a really long time. A fjord is actually a narrow inlet framed by steep sides or cliffs. Over time, the glacier carves a U-shaped valley that becomes partially filled by the ocean. What you’re left with a cool looking fjord where cruise ships like to travel. 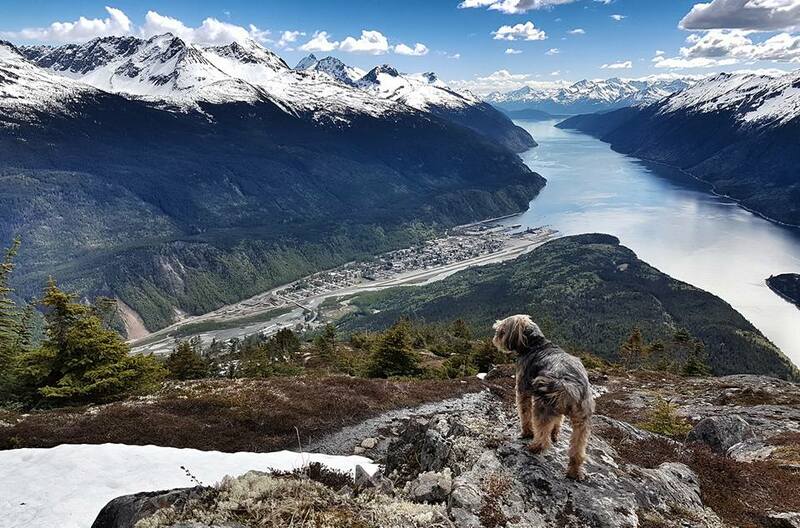 Just think… If fjords didn’t exist, Skagway would have no port and also probably wouldn’t exist. Man… that’s deep… like a fjord. As you travel through the Lynn Canal, you can see smooth mountainsides on either side of the ship towering high into the sky. At about 3,500 to 4,000 feet, you will notice the mountains become more jagged. Glaciers smooth the landscape as they move, so at one time the glacier that formed the valley was as high at that spot. Factoring in the 2,000 feet of ocean depth means this glacier was over a mile high. Like the stadium for the Denver Broncos. “Fjord” is a strange word and difficult to pronounce if you’ve never heard it before. You would think it should be spelled f-y-o-r-d. So, why isn’t it? Well, the word fjord is Norwegian because there are more fjords there than you can shake an oosik at in that country. If you’re Norwegian, a fjord can refer to any long body of water, but here in the US, it describes a glacially formed valley in the ocean. The original word has Norse origins. The Norse were a people that liked rune stones and had blond hair. There are some excellent documentaries about the Norse people including Thor, Thor: The Dark World, and Thor: Ragnarok. The original word, fjǫrðr, literally meant a lake-like body of water used for passage or ferrying. Here in Skagway, we also use the fjord for ferrying, and you use it as a passage to get here, which proves nothing really changes. All of this means that Norwegians and North Americans have totally different definitions of what a fjord actually is, so it’s best to avoid the topic entirely. You don’t want to get into one of those arguments where you “agree to disagree” and then find out later that you were both right. So annoying. 5 Skagway secrets that will save you money What are the northern lights?